Testing: Southwest Electronic Energy (SWE), successfully completed 10,000psi pressure testing of its SWE SeaSafe Smart Battery Module. The exhaustive two day test conducted in the 30 inch hyperbaric chamber at the third party test laboratory included nine complete pressure cycles up to 10,000 PSI and back down to zero psi while continuously performing live charge and discharge. In 2013, battery solutions innovator Southwest Electronic Energy Group announced breakthrough subsea ready, Li Ion battery products. SWE SeaSafe with its patented BMS (battery management system) safely powers subsea vehicles or infrastructure with 4X energy. 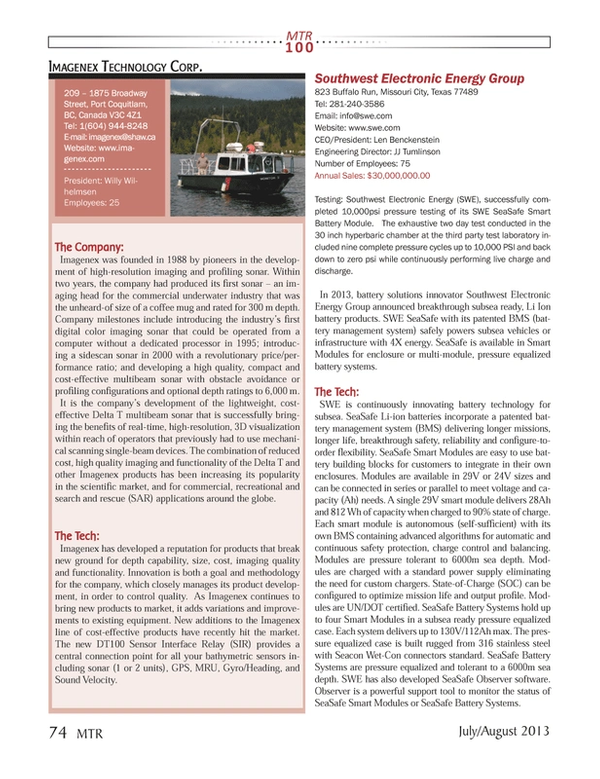 SeaSafe is available in Smart Modules for enclosure or multi-module, pressure equalized battery systems. SWE is continuously innovating battery technology for subsea. SeaSafe Li-ion batteries incorporate a patented battery management system (BMS) delivering longer missions, longer life, breakthrough safety, reliability and configure-to-order flexibility. SeaSafe Smart Modules are easy to use battery building blocks for customers to integrate in their own enclosures. Modules are available in 29V or 24V sizes and can be connected in series or parallel to meet voltage and capacity (Ah) needs. A single 29V smart module delivers 28Ah and 812 Wh of capacity when charged to 90% state of charge. Each smart module is autonomous (self-sufficient) with its own BMS containing advanced algorithms for automatic and continuous safety protection, charge control and balancing. Modules are pressure tolerant to 6000m sea depth. Modules are charged with a standard power supply eliminating the need for custom chargers. State-of-Charge (SOC) can be configured to optimize mission life and output profile. Modules are UN/DOT certified. SeaSafe Battery Systems hold up to four Smart Modules in a subsea ready pressure equalized case. Each system delivers up to 130V/112Ah max. The pressure equalized case is built rugged from 316 stainless steel with Seacon Wet-Con connectors standard. SeaSafe Battery Systems are pressure equalized and tolerant to a 6000m sea depth. SWE has also developed SeaSafe Observer software. Observer is a powerful support tool to monitor the status of SeaSafe Smart Modules or SeaSafe Battery Systems.